Is genuine reform taking place in Burma/Myanmar, or is there merely an illusion of progress? Debate rages amongst observers on whether the ruling State Peace and Development Council (SPDC) is really transforming the strife-torn state into a 'peaceful and developed modern nation' or squandering opportunities in order to continue its authoritarian rule. The argument that Burma/Myanmar is a stalled state waiting for the long promised transition from military rule often ignores much of the complexity of the everyday reality where opportunities for some progress exist. This edited collection brings together several acknowledged experts on Burma/Myanmar who move beyond the stasis theory to find opportunities for change and bureaucratic reform in several key sectors. By looking at the economy, military, health and agricultural sectors, the contributors find evidence of a middle ground between the vaunted government pronouncements of progress and the opposition's dire warnings of imminent collapse. 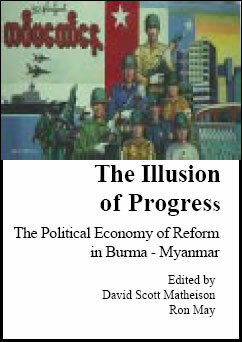 Including chapters by Josef Silverstein, Mya Than, Andrew Selth, Morten Pedersen, Emily Rudland, Ardeth Maung Thawnmung, Tin Aung Cho and Khin Ma Mar Kyi, this edited volume looks beyond the polarized debate which pervades perspectives on the country, to investigate the real progress of development in Burma/ Myanmar.